The Emerson String Quartet's final concerts with cellist David Finckel will include performances in Chicago, Philadelphia, Washington, D.C., Houston, and at New York's Carnegie Hall on May 4th with Renée Fleming. The Quartet's final public New York City concert with Mr. Finckel will be presented by WQXR at The Jerome L. Greene Performance Space on May 6th at 5:30 pm EST. To mark David Finckel's departure from and Paul Watkins's debut with the Emerson Quartet, all five gentlemen will perform together for the first time on May 11th at the Smithsonian Museum in Washington, D.C. Paul Watkins will join Mr. Finckel and the quartet for the final selection on the concert, which will be Franz Schubert's String Quartet in C Major, D 956. The Huffington Post has featured a series of blog posts individually written by the Emerson. The Quartet's website www.emersonquartet.com has been redesigned as a reflection of the last 35 years and includes a slideshow of iconic images as well as a dedicated slideshow to introduce Paul Watkins. The final album with David Finckel, entitled Journeys, will be released in April on the SONY label and will include Tchaikovsky's Souvenir de Florence and Verklärte Nacht. The Emerson String Quartet stands alone in the history of string quartets with an unparalleled list of achievements over three decades: over thirty acclaimed recordings since 1987, nine Grammy® Awards (including two for Best Classical Album, an unprecedented honor for a chamber music group), three Gramophone Awards, the coveted Avery Fisher Prize and cycles of the complete Beethoven, Bartók, Mendelssohn and Shostakovich string quartets in the world’s musical capitals. 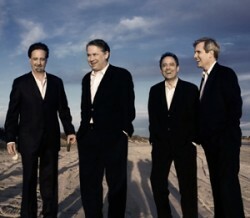 In March 2011, Sony Classical announced an exclusive agreement with the Emerson String Quartet.